Bonus: Private Event - 66.67% discount on ending ICO price. Pre-TGE - 50% discount on ending ICO price. TGE phase 1 - 33% discount on ending ICO price TGE phase 2 - 16.67% discount on ending ICO price TGE phase 3 - ending ICO price. Elysian is an innovative new decentralized platform that will use the Ethereum blockchain to secure customer data, facilitate Ecommerce transactions, and drastically change user experience. The integration of smart contracts and blockchain technology will ultimately provide a higher level of security in the realm of Ecommerce. The interoperability of the platform will serve as the basis for future scalability and sustainable growth. Extensive analysis into competing businesses exposes a lack of unprecedented user experience. The current status quo is not healthily sustainable as advancements in technology become more commonplace. The implementation of Artificial Intelligence and Virtual Reality into the Ecommerce industry will provide efficient website navigation, revolutionary product visualization, and unparalleled consumer convenience. The extrapolated Ecommerce revenue projections indicate a lucrative future if companies can adapt to necessary market transformations. The integration of the Elysian token into the platform as a method of access to transactions provides entry into our ecosystem. Consumers will be incentivized to become incorporated into the Elysian community and play a vital role in the growth of the company. Business to consumer (B2C) Ecommerce is a massive global market which, in 2017, surpassed $2 trillion in sales and is expected to have an annual growth rate of 9.9%. 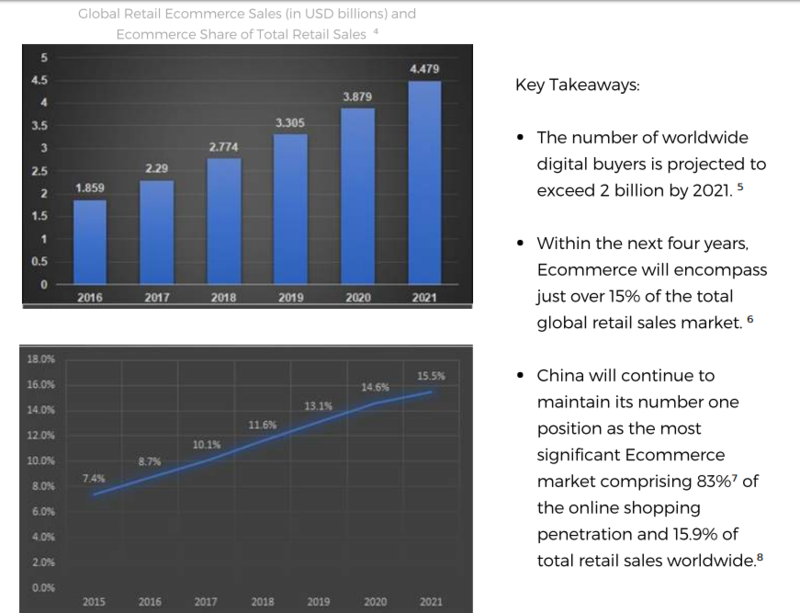 Indeed, the most current estimation is that global Ecommerce sales will exceed $4 trillion by 2021. As the market continues to steadily grow, statistical evidence shows that platforms such as Shopify and Woocommerce are thriving. Shopify experienced a growth in revenue from $130.383 million in Q4 of 2016 to $222.814 million in Q4 of 2017. A decent percentage of this can be attributed to the rise of mobile commerce. Progressively, more businesses are transitioning to the use of platforms such as Shopify because of their simplicity and convenience. Woocommerce, despite still being fairly new to the industry, has quickly become a dominant force, powering over 380,000 online stores.¹² Although it is different from Shopify, its easy setup, flexibility, and customization are lucrative to clients. A significant amount of the growth in the industry can be attributed to the rapid adoption of Ecommerce in Asia. The progressive increase in Ecommerce revenue and platform adoption in Asia is at a higher rate than any other part of the world. Further extrapolation shows that Asia will continue to thrive as the principal continent in terms of Ecommerce market revenue, exemplifying the importance of targeting this market in the initial stages of the company. Proper market penetration into Asia solidifies growth, consequently causing a snowball effect; other parts of the world will follow suit accordingly. The current status quo is sufficient for these businesses to subsist without being threatened by competition, but this is only temporary. These platform companies are well-positioned in the market for factors such as number of clients, ease of use, reputation, and scalability, but there are several aspects that can be improved. None of the aforementioned companies operate on the blockchain, and the user experience is not overly impressive, despite its effectiveness. In addition, the scalability has room for growth and there are no unprecedented technological implementations. 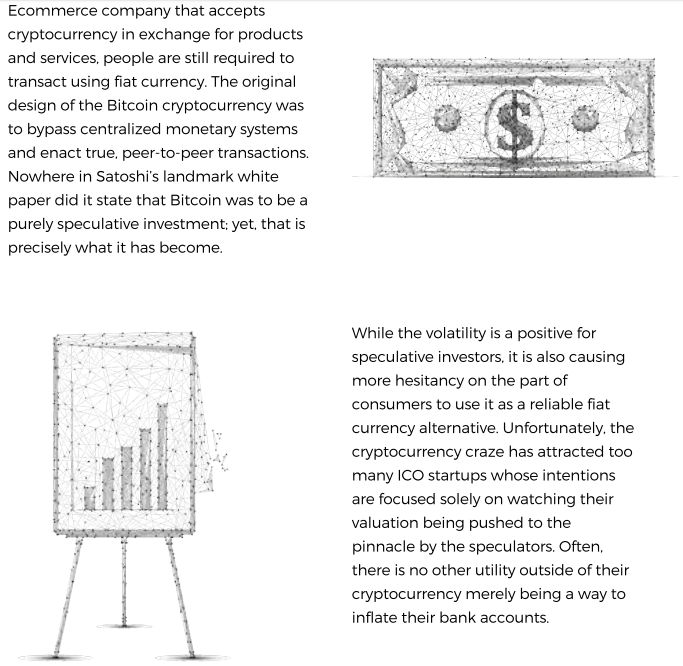 For these reasons, combined with the fact that there are very few companies like these in the cryptocurrency market, the progression of this niche moving forward into the future exposes vulnerabilities. The emergence of blockchain technology is beginning to revolutionize the internet. However, blockchain itself is still in its infancy. Consequently, many businesses in the Ecommerce industry are still unaware of blockchain technology or are content with the current status quo in terms of cybersecurity. The alarming number of data breaches are evidence of this. The ability to store customer data on the blockchain provides a revolutionary new level of security that was nonexistent in years past. This is a prime example of how the creation of blockchain in its purest form was meant to be used for the real-world application. This immutable ledger serves as the foundation for transactions and storing data that cannot be tampered with. Decentralization prevents the data from being on one single server and openly visible to hackers. This has an immediate effect on overall data security. The use of smart contracts also provides another element of trust for consumers. The contract that is coded by the developer will store all aspects of the transaction to ensure that the process goes smoothly. The smart contract will be audited to guarantee proper coding. The audit further strengthens the security and legitimacy of the smart contract. The principle is to provide a contract that is not only more secure, but also is set in stone to prevent manipulation and guarantee that a transaction is processed in a proper manner. WE WILL.? They each shouted and so they ran to the bed room bickering about who will get to go first. hi!,I love your writing very much! percentage we keep up a correspondence extra about your article on AOL?